Manama: A study is to be conducted for building a new causeway between Bahrain and Saudi Arabia following an agreement between King Hamad Bin Eisa Al Khalifa and Saudi King Salman Bin Abdul Aziz, reports in the two neighbouring countries said. The causeway will be funded by the private sector. King Salman arrived in Bahrain on Tuesday to take part in the 37th Gulf Cooperation Council (GCC) summit alongside leaders from Kuwait, Oman, Qatar and the United Arab Emirates. Following the summit, King Salman started his official visit to Bahrain, the third country he visited as part of his four-nation Gulf tour that also took him to the UAE, Qatar and Kuwait. The King Hamad Causeway will be the second terrestrial link between Bahrain and Saudi Arabia. 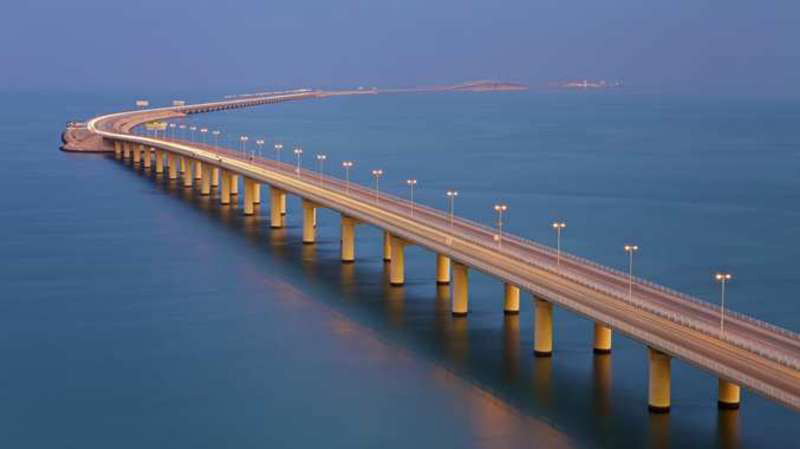 The 25-kilometres-long King Fahd Causeway was opened on November 26, 1986 by the then Emir of Bahrain Shaikh Eisa Bin Salman Al Khalifa and then Saudi King Fahd Bin Abdul Aziz. Millions of people on private vehicles, buses and trucks have been using the busy causeway over the years, with a daily average of more than 40,000. The first mention of a new causeway project came following a meeting between King Hamad and the late Saudi monarch King Abdullah Bin Abdul Aziz in September 2014 in the Red Sea port city of Jeddah. Reports at the time said that the causeway would be used by passenger trains and freight trains besides vehicles. The railway lines will be part of the wider 2,170-km GCC railway network, the reports added. Initial estimates for the King Hamad Causeway suggest that it will take about four years to complete. The business community in Bahrain has welcomed the project as a much-needed boost for the local and Gulf economies. Several business people have expressed the view that the project would reinvigorate trade and commercial exchanges between the two kingdoms and other countries in the region and beyond. “It was a most pleasant surprise and we are confident that the new causeway would consolidate commercial, economic and social relations between Bahrain and Saudi Arabia,” said Abdul Rahman Fakhro, a businessman. “It will eliminate the crises and problems on the King Fahd Causeway because of its limited capacity. We are really pleased, but we also look forward to plans and designs that anticipate huge developments in the distant future, and not just within five or ten years,” he said. Businessman Kadhem Al Saeed sought to highlight the significance of the proposed railway links. “The railway movement of products has become an urgent necessity, particularly as the region witnesses fast developing rates of commercial activities, urbanism and demography,” he said. Yousuf Al Mesha’al said that Bahrain and Saudi Arabia as well as other countries in the region would benefit from the construction of a new terrestrial link. “It will greatly help with economic integration in several areas,” he said. “The Bahraini market, much smaller than the Saudis, will benefit greatly while Saudi Arabia will benefit from the knowhow of Bahrainis who can commute every day between the two countries without putting pressure on housing or health services in the Saudi kingdom, for instance,” he said.